Squash comes in many, many varieties, but the fundamental distinction is between “Winter Squash” and ”Summer Squash”. That is not an indication of when they are grown: rather, winter squash are long-keeping, whereas summer squash are for immediate consumption as grown. Winter squash are difficult, since most take quite a long growing season; moreover, their space demands are, shall we say, imperious. And the result is a one-trick pony (“add brown sugar and butter”) of—to us—less than exciting culinary proportions. The virtue of winter squash lies (or lay), we suspect, largely or wholly in its keeping ability in the days before modern appliances were available—mais chacun à son goût. Granted, one can find occcasional culinarily sound uses for the stuff—we have a recipe for a nice light curry stew with winter squash and tofu—but whether they justify growing it is open to question. Probably the strongest reason would be the occasional squash pie—which would be a direct substitute for pumpkin pie (pumpkin itself being just another sort of winter squash). So the utility of winter squash depends much on personal taste and one’s priorities at the table. Well, we have now found an exception to the comments above: the Kabocha squash (aka “Japanese pumpkin”). The flesh is firmer and dryer than the typical winter squash, and while sweet, not so gross as most others. It worked exceedingly well in a recipe in which it absorbed other flavors without getting icky sweet. We liked it and will grow it. As a rough rule of thumb, the bigger the squash type wanted, the longer the growing season required—which rather limits us. The Kabocha we’re growing (there are apparently many variants, typically not named in the catalogues) is listed at 95 days; that’s a big stretch for us, but we’re going to try it and see what happens. Our mid-season day is July 22nd, so if we work back 47 days, we get June 5th as transplant day (and September 8th as harvest time). On June 5th the average high is 73° and on September 8th it’s 75°, so it should work, though it’ll be a close-run thing. Summer squash seem to us to be largely in what we have elsewhere here called the “kraft-paper” category (that is, treated as the vegetable is usually treated in the kitchen, even kraft paper would taste good, and the paper would have about as much to do with that as the vegetable in question does). A possible exception is the attractive “patty-pan” type of summer squash; we are in agreement with the many who report that they find those squash to be at least a little more interesting, especially texture-wise, than the inevitable zucchini (one source states that “There isn’t much difference in the flavors of the [summer-squash] varieties, but there is some difference in the texture of the cooked flesh”). Our own patty-pan eating experiences support that view: they’re firmer and “fleshier”, not soppy like zucchini. Though hybrids are very common in this type—beware what you are ordering—there remains a good selection of open-pollinated types for the home gardener, even as to color (white, yellow, green—though the green and the white are nearly identical). Even though our need for summer squash doesn’t justify it, we’ll probably grow a couple of the available colors for the sheer fun of it. yellow: Gelber Englischer Custard (?? days) - recommended for cooler climates; unusual appearance. Possibly the best of kind. We doubt that there is any taste difference between the colors, but if we do find that we have a favorite, we’ll concentrate on that kind in the future. As with all heat-loving and long-season plants in this climate, one is best to start squashes off indoors as seedlings, typically about 2 to 3 weeks before their anticipated transplanting out. When to sow is, as always with heat-lovers, a crucial question. Several sources say not to transplant seedlings out till the soil temperature is reliably 70° F. Using plastic mulch and row covers helps in growing summer squash, but is not, in our experience, vital. 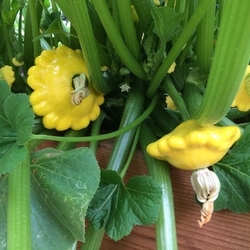 Considering how fast summer squash grow—7 or 8 weeks from transplant to maturity—we can afford to be late getting them out, so as to be sure about weather. All in all, we feel that a target transplant date of June 10th is about right, but with a close eye kept on the soil thermometer. That would suggest, in turn, a seedling-sowing date of about May 20th. Summer squashes are quick growers, so sow seed in large-size peat or cow pots. Squashes want a very warm soil for optimum germination, so get the soil as warm as you can, presumably with heating mats (they will germinate at low temperatures, but one might as well give them their optimum start). Plant the seeds about an inch deep, being sure to set the pointed end downward. Water the soil just enough so that there’s a trace of moisture: seeds tend to rot in moist soil (though if you’re heating the soil with a pad, that’s probably a low risk). Squashes like a rich, well-drained soil with a pH ideally between 6.5 and 6.8; they are tolerant, but heavy clay is not good for them. “Rich” means rich: add a deal of well-composted steer manure or other nitrogen-rich fertilizer to their soil when preparing it. Transplant seedlings into the garden once their first true leaves appear (or when their roots begin to grow through the peat or cow pot)—but, if the outdoor soil temperature is not yet reliably 70° by the time the seedlings are clamoring for planting out, it’s wise to use some sort of cloche or Wall O’Water arrangement, or row cover at the least. Keep your pattypans watered well and regularly: being relatively large plants, they are excellent candidates for drip watering. They should come into production somewhere around 7 to 8 weeks after transplanting out. One can scarcely overstate the importance of keeping all summer-squash plants carefully picked on a daily basis once they do start to set fruit. If you leave the fruit on the plant too long, it gets tough and—while not inedible—not enjoyable. The absolute largest a pattypan should be allowed to get is perhaps 3 inches across, but many sources say to pick them at 2 inches or even 1 inch in diameter to get the best flavor and texture. They are legendarily prolific producers, so don’t hesitate to keep them picked (even if you don’t want any just then: you need to keep them producing). Just keep picking till the plants finally stop setting fruit as the weather gets cold. Keep in mind that all squash blossoms are edible, and are prized by some cooks (who dip them in batter—often cornmeal batter—then fry them). The genus Cucurbita lies within the confusingly like-named family Cucurbitaceae. Within the genus, there is some confusion in differentiating between pumpkins and the various squashes, as well as to their origins. T.W. Whitaker and G.W. Bohn presented evidence in 1950 that five species of Cucurbita, known as pumpkins and squash, originated in the Americas. Pumpkin: the edible fruit of any species of Cucurbita used when ripe as a table vegetable or in pies; flesh is somewhat coarse and/or strongly flavored, hence is not generally served as a baked vegetable. Summer Squash: The edible fruit of any species of Cucurbita, but most commonly of C. pepo, used when immature as a table vegetable. Winter Squash: The edible fruit of any species of Cucurbita used when ripe as a table vegetable or in pies; flesh is usually fine-grained and of mild flavor, hence is suitable for baking. Squashes are native to the warmer portions of the Americas, and were domesticated by native Americans in the regions of Central America to Mexico and Eastern North America; remains of wild or cultivated squash dating back to around 9000 B.C. have been found in native settlements. The C. pepo types are apparently native to North America north of today’s Mexico City. The word “squash” comes from the Algonquin word for squash, askootasquash, roughly “food eaten raw”. Most wild squashes are small and bitter. At first, squash fruits were doubtless collected simply to make into rattles for ceremonies and dance; later, they were used like gourds, for dishes and storage vessels. Eventually, though, Native American farmers began to grow and select improved varieties for food crops. Even then, they were at first grown for their oily, protein-rich seeds, and only later—as better-tasting varieties were selected—were they finally eaten for their flesh. By the time squashes were introduced into Europe in the early 1500s, most of today’s recognizeable C. pepo types had already been developed. You loaded this page on Friday, 19 April 2019, at 16:46 EDT. It was last modified on Sunday, 3 February 2019, at 06:02 EST.